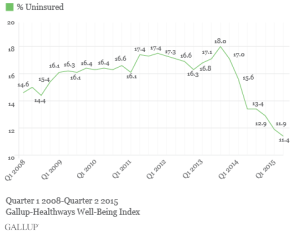 The numbers back his claim, and the ACA has succeeded where many have speculated its failure. So why didn’t he, in his final address towards millions of Americans, praise his administration’s overhaul of the health care system? Most likely because public approval for Obamacare has been divided, almost to a tee. Since Obamacare’s inception in 2010, nineteen states still have not expanded Medicare to its citizens. States like Kentucky plan to modify or even eliminate existing Medicare options. We look at the polls and data and see a strong divide by partisanship. Politicians, mostly right-leaning ones, don’t like the idea of a government-controlled health care system, and they don’t like paying more for one. Until a health care system can be formulated that has bi-partisan appeal, millions of Americans will pay the price of politics, and millions will remain uninsured. 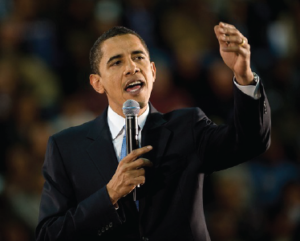 On January 12, President Barack Obama will deliver his final State of the Union Address to the American people. He will address one of the cornerstones of his Presidency, albeit the most controversial one: the signing of the Affordable Care Act (ACA), colloquially referred to as ObamaCare. The ACA was the most significant overhaul of the U.S healthcare system we’ve seen in ages, though its goals were straightforward: to decrease the rate of uninsured by increasing public and private coverage, and increase the affordability and quality of health insurance. Many point out that the ACA has several key flaws which make it an ineffective plan, while others look at the numbers to tell a different tale. state-based insurance exchanges. In a report by the CDC, the average number of uninsured during the period from January to September 2014 was 11.4 million less than the average in 2010. Additionally, Gallup states that the percentage of uninsured Americans decreased from 18% in 2013, to 11.4% in 2015.
to the federal poverty line (133%-400%). For example, those 133% above the poverty line pay a max annual premium of $992 for healthcare, while those at 400% pay a max of $8,379. On the whole, however, more people are paying less than they did before. Several studies point out that half of those who buy insurance right now, predominately lower-income families, are eligible for subsidies, which is a success for the law. 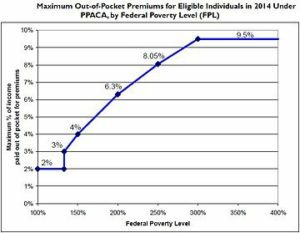 The ACA’s original intent was to help the lower-income families with subsidies, so it’s natural that they benefit the most. One of the biggest detriments to the ACA is opposition within the government. Several states, namely those in Republican control, chose to reject Medicaid expansion—and over half of those uninsured live in those states. What does this mean for those in states opposed to Medicaid expansion? States that chose to oppose may keep preexisting Medicaid eligibility requirements, which may or may not benefit the people. For example, in Kansas, only adults with children under 32% the poverty line are eligible for Medicaid. Families with children in the 32%-100% bracket are not eligible for Medicaid or subsidies, and adults without children are prevented from obtaining Medicaid whatsoever. Opponents of Medicaid argue that Medicaid expansion will cost the state more than it’s worth. According to an article by Forbes, the cost of expansion is far more than expected. In states like Kentucky, the amount of enrollment in Medicaid has doubled expectations. Costs have substantially increased in states like Ohio and Michigan, putting the burden on the shoulders of taxpayers. Furthermore, because of increased enrollment, the line to the doctor has substantially grown in length; with increased expansion is an increased demand on the state and hospitals. The Affordable Health Care Act, as a whole has been a success. More people have healthcare insurance, and it’s cheaper for those who need it the most. It is however, not perfect. The consequences of a concerted push towards universal healthcare will be an increased burden on the state and its taxpayers, and many will not like that. As we watch the President’s State of the Union Address we must be mindful of what the ACA has achieved, and how it will change with the eventual inauguration of a new President.